Now that I’m swimming half a mile twice a week, I find that my bathing suits only last about six months. Timing is dictated by the size of the holes chlorine has eaten into my suit. When I start feeling like I’m wearing a thin slice of Swiss cheese, I know it’s past time. This never happened when my bathing suits lay in perpetual darkness in the bottom of my dresser drawer and never came out. 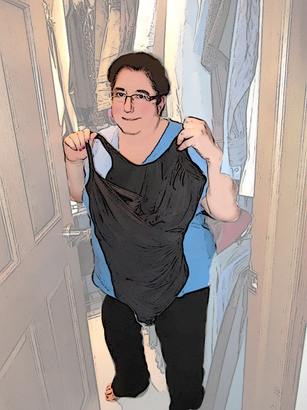 It's not just the cost of the swimsuit that's so upsetting; it's the idea that I must again endure the humiliation of the hunt for the “passable”  we’re not talking perfect  bathing suit. For example, I asked the size 2 young woman manager of a swimsuit store if she carried women's sizes. She looked at me as if it were a trick question, and then answered, "That's all we carry." I’m fully aware you don’t sell men's swimsuits here, but that wasn’t my question. I was asking whether you carried women's sizes larger than 16. Oh, no, you have to shop online for that. I know we’re talking larger sizes, but REALLY, when the product is bathing suits, not winter coats, how much extra display space would they take up? In a last ditch effort, I went to a nearby department store an hour before closing, knowing it would be empty and hoping my regular salesperson would be there. As luck would have it, she was on vacation. Filling in for her was a very helpful salesman. Fast on my feet, I asked him to look up the suit I had bought last time and order me the exact same one. No such luck. The store no longer carried that brand. for “laying out” at the beach. It would be my “fun” bathing suit. Surely this girl was yanking my chain. Do I look like someone who has ever owned a “fun” bathing suit? Especially a two piece one in bold tropical prints and colors with names that sound like the latest flavors in martinis? Fun jewelry yes, but fun bathing suits no.